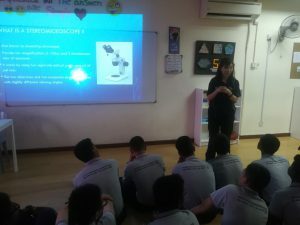 On 9th August 2018, Professor Ting Kang Nee, Dr Then Sue Mian and Ms Siti Asma from the Department of Biomedical Sciences were invited to Dignity for Children’s Foundation located in Sentul Boulevard to conduct a science session with the students. 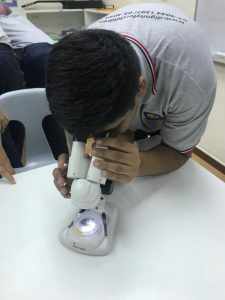 The main objective of this session was to expose the students to the use of microscope and to help them discover an entirely different world of science. This event was funded by Cascade grant (University of Nottingham) under the project ‘Promoting Science Using Microscopes’. The event was led by Prof Ting and Dr Then, assisted by Ms Asma. A total of 50 students age ranging from 15-16 years old and 4 teachers participated from Middle Secondary Department in the event. 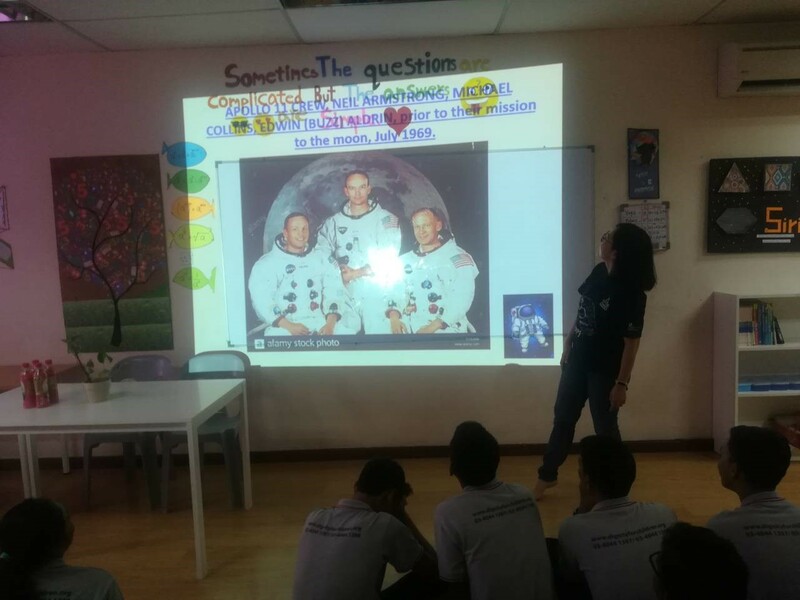 Dr Then started with sharing her research about space followed by a quiz session. Students were amazed and excited to learn about space which they have heard or seen in movies only. The highlight for them was the quiz session where they were exposed to an online platform to asses themselves and compete with their friends. Dr Then was sharing her research experience on a space project. “I learnt a lot about space. I feel shocked because I can’t believe that space has worms that also can live on earth” says Yin. “I am very thankful to Amna for organizing this and all the professors who are the expertise of their field to find time to teach our students. Today’s session was an eye opener for many of the students. I hope that we can continue to collaborate with Nottingham and wish if our students can visit the lab next time” – Teacher Jeff (Teacher at MS Department). The second half of the session was conducted by Prof Ting. She briefed the differences between light microscope and stereomicroscope followed by the hands-on activity where students observed different insects and crystals under the RMS microscope and C. elegans under a stereomicroscope. Indeed, this was the crowning moment of the event. 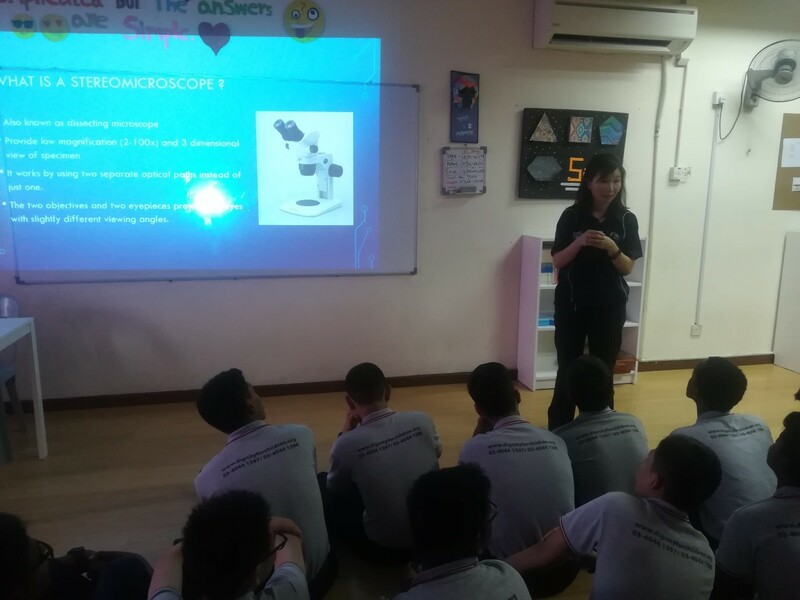 Prof Ting was giving a talk on the different types of microscope. 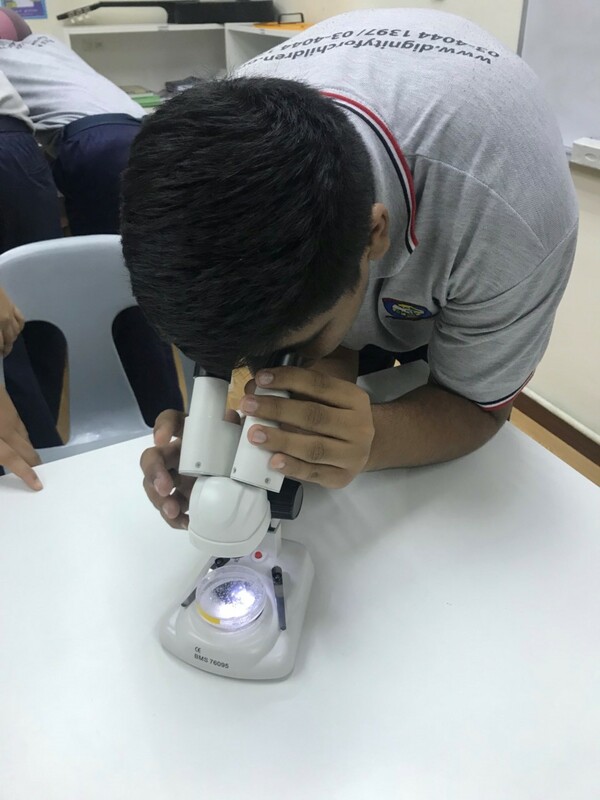 A student was observing a crystal sample using the RMS microscope. 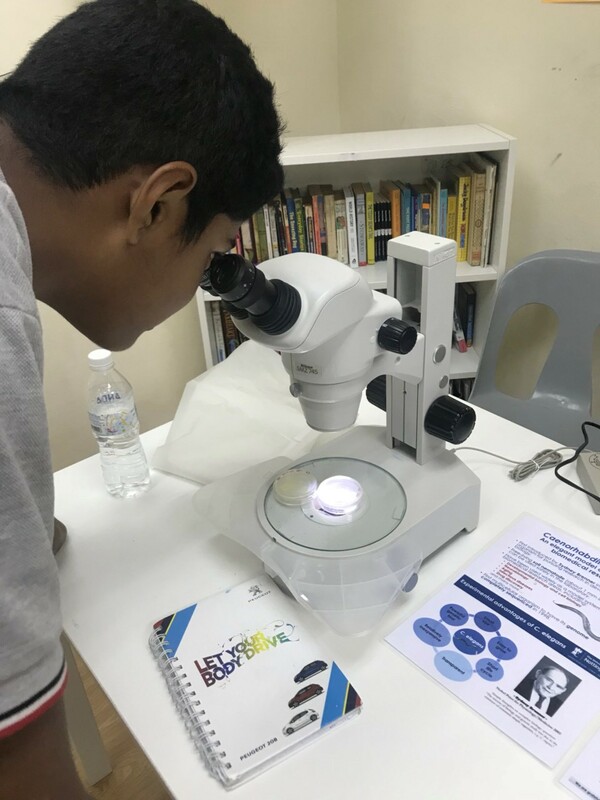 A student was looking at the worms sample under a stereomicroscope. “We have gotten a lot of ideas about space. The professors have brought real microscopes so that we could see the details of tiny creatures. We really enjoyed learning with them” says Jun. Dignity for Children Foundation is a community learning center which believes in providing quality education and care to break the cycle of Poverty. Over the course of 20 years, they have transformed the lives of many poor through education. The school doesn’t only focus on providing a quality academic education, but they also prepare their kids for the real world. Overall, the day was fruitful! We are hoping to impact through more collaborations with Dignity for Children Foundation.